I am currently eliminating pork from our diet……shhhh don’t tell the kids or my husband. Alex’s one meal request this week was BBQ sandwiches and potato salad. Typically I make BBQ pork sandwiches but today I switched it up and made slow cooker BBQ chicken sandwiches. I also replaced the store-bought BBQ sauce with homemade BBQ sauce. 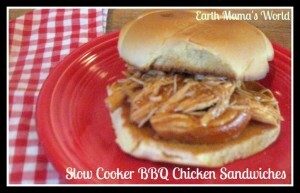 I crossed my fingers and served my family BBQ chicken sandwiches. I am happy to report that the BBQ switcheroo went great. Not one complaint and that is a rarity! This is such an easy meal to make. 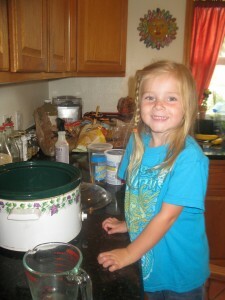 I often make slow cooker BBQ for family gatherings because you can easily double or even triple the recipe. If I am preparing this for a large crowd I often make one pot regular and one spicy. 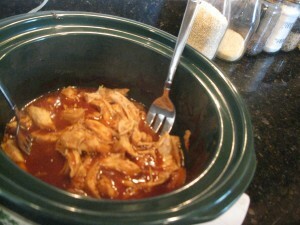 Combine all ingredients except the chicken in a slow cooker and combine well. Ava did the mixing for me. Add chicken, stir, and cook on high for 3-4 hours. Remove lid and pull the chicken apart with two forks. It should shred easily. Serve on toasted rolls or buns. Enjoy! 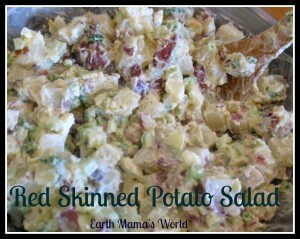 This dish is wonderful served with Red Skinned Potato Salad (with or without the bacon!). Sounds like this week-ends meal! Yum! Wish I was there to enjoy with you mama! I think this will be what I make when I get back from Budapest next week. I know I won’t feel like “cooking” so this will be perfect! I made it ahead this weekend to have for dinner this week. It ended up a little too ketchup-y for my taste but after adding hot sauce it’s perfect. Next time I think I’ll replace some of the ketchup with hot sauce. 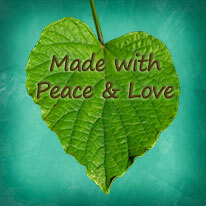 And I’ll make a bigger batch!! I could go for seconds! Thanks for this recipe!! It was so good I made it again but put it in the freezer for when I get back from my next trip. I also put a slice of grass cheese (cheese that’s made from the milk after cows get the first fresh grass of spring) on my sandwich. Mmmmm!!! Yummm grass cheese! Jessica, I wanted to tell you that I made the switc to greek yogurt in place of sour cream…you gave me that hint didn’t you?…thank you!! So, turns out, it doesn’t come out so well when you forget and leave it cooking on high all night 🙁 Now the house smells like burnt BBQ and 20euro worth of chicken is charred. Glad you’re enjoying the greek yogurt/sour cream swap!! I’m going to see if it’s at all salvageable as that’s a lot of expensive organic chicken to waste. Perhaps if I add more sauce it will be edible? Perhaps if it doesn’t taste all that good I won’t be tempted to overeat 🙂 Sadly, grass cheese season is over but luckily (and dangerously!) there’s tons of wonderful cheeses available here! I don’t buy sour cream at all anymore although I will admit to loving it still 🙂 I’m always so happy when I inspire someone who as inspired me so much! !